The biggest top order predator of them all is putting the manta ray on the edge; us. They’re being caught in fishing nets, hunted for use in traditional Chinese medicines and suffering due to climate change. Their natural predators are large sharks, killer whales (Orcinus orca) and false killer whales. If attacked and wounded, their tissues regenerate quickly. The manta ray is easy to target because of their large size, slow swimming speed, swimming in packs, repeated visit to the same places, and their inquisitive nature. One reason they are hunted is for the dubious medicinal benefits. Their gill rakers are said to be able to cure diseases, including chickenpox and cancer. 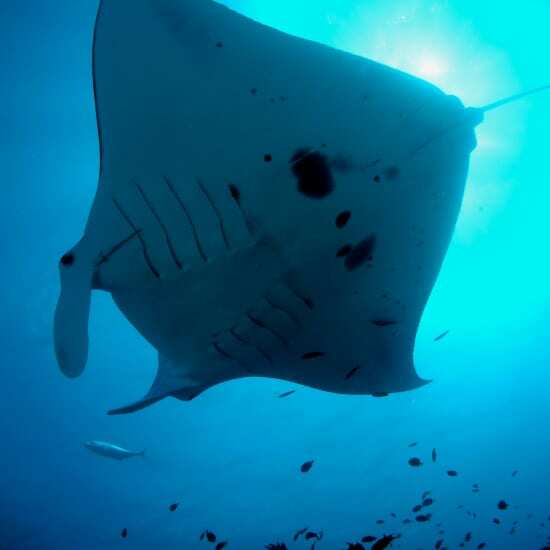 Known as the birds of the sea; the manta ray has two massive triangular-shaped fins that resemble the wings of a bird. They have also been known mythically as the great devilfish - they were worshipped by the Peruvian Moche people and sailors used to believe they could sink boats by pulling on the anchors. Basically they are massive and powerful; therefore humans have been scared of them for centuries. In reality though the manta ray is a placid creature, and - unlike the sting ray - doesn’t have a barbed stinger! • $5,000; will fund a teacher to attend Project Manta – Ningaloo Reef and share the experience with their school, live from the field. • $10,000; will upgrade and expand the Manta Ray photo identification database for the project. • $50,000; will purchase and attach 7 x satellite tags to more effectively monitor population movements along the west coast of Australia. Earthwatch has partnered with Murdoch University and University of Queensland to learn as much as possible about these graceful giants of the sea to protect their habitat and their lives. The manta ray gets around – they like a few oceans, including the Indian, Pacific and Atlantic in tropical waters. Our focus for Edge Pledge is the Indian Ocean off the West Australian coast. Manta rays cover hundreds of kilometres throughout the year and even cover 70km in a day. They hang out along the coast and love coral and rocky reefs and around bays. The manta ray is definitely not a man eater. They are small-stuff eaters such as plankton and tiny creatures known as zooplankton. Its teeth are useless when feeding as they get their food by filtering it through plates called gill rakers that are found in their gills. They just open up and start vacuuming. The manta ray has parasite problems. But through this adversity they have created a beautiful relationship with cleaning fish. They visit ‘cleaning stations in coral reefs where small fish remove the parasites from their skin. Females can start having offspring around 8 to 10 years old while males are ready to mate at 6 years. They are not very fertile and only have one offspring every 2-5 years – usually just one. In breeding season the males chase the females to mate; courtship can last about 2 hours. The female incubates the eggs in side for 12 months until they hatch. In this way the manta ray gives birth to live offspring. In Australia, manta rays occur in shallow water and are a common sight to swimmers, snorkelers, and divers. Yet despite increasing research efforts around the country we don't know much about them. Also the global distribution and easily identified shape of the manta ray make them an excellent indicator species by which to monitor the effects of environmental change on our oceans and reefs. Global warming has caused marked changes in oceanic conditions, including water temperature, current patterns, and acidification—all of which may have dramatic consequences for mantas and the reefs on which they depend. Correlating data on manta distribution and movements with large-scale oceanographic changes will help scientists monitor global oceanic health.